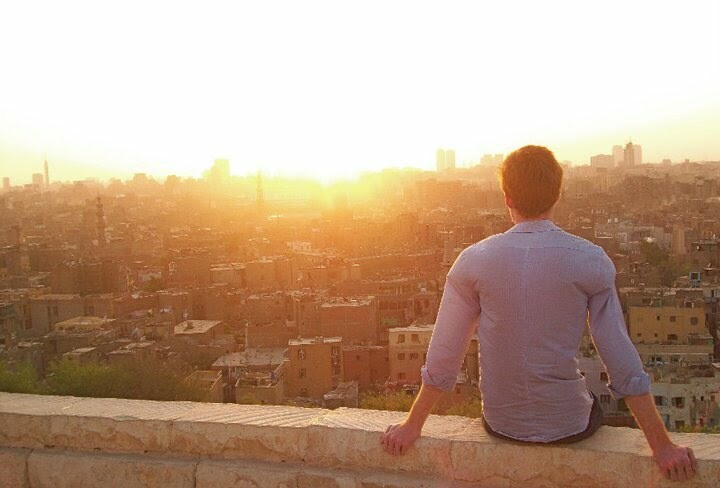 Evan Garris (Political Science 2011) says he was overcome with emotion recently while watching television reports of the jubilant crowds celebrating Hosni Mubarak’s resignation in Cairo’s Tahrir Square. The Smithfield, NC, native described his reaction to his Arabic teacher in the email reprinted below. Garris had spent the summer of 2010 travelling in the Middle East, dividing his time between Egypt, the UAE, and Lebanon, as he studied with Jodi Khater (Foreign Languages and Literatures) and her husband Dr. Akram Khater (History). After graduating in December, Garris plans to continue his education and pursue a PhD in Comparative Literature. As you can well imagine, I’ve been glued to the news all day. Earlier, I caught a segment on CNN in which a correspondent was amidst the jubilant masses in Midan Tahrir. She spoke Arabic fluently, and was interviewing Egyptian men and women and then translating their words for CNN’s English-speaking audience. As for me, she could have eschewed the English translation altogether, because I found myself understanding every word spoken. Anyways, I want to thank you for helping me acquire the skills needed to understand the thoughts and feelings of those interviewees in their native tongue. It was an extremely touching moment for me; like the barrier of the television screen had disappeared and I was standing with everyone in Midan Tahrir. Hearing the sheer joy, elation, and excitement in their voices—and more importantly, their words—brought me to tears. Language, its power, and my experience living in Cairo have effectively humanized these events for me in a way I could never have imagined possible. So much of what I have come to know is either misrepresented or not represented in Western media and by pundits and politicians. I feel that a critical opportunity is lost in that absence of appropriate context, particularly the chance to construct a narrative that puts a human face on world events and emphasizes the incredible extent to which civilizations are interpenetrated. That absence owes a large part of its existence to the language barrier. So again: thank you. I owe both you and Akram so much.